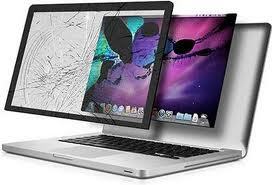 We were one of the first company to offer macbook screen repair and glass replacement for MacBooks and MacBook Pros. Back in 2008 when apple first came out with the design featuring glass covering the LCD on the MacBook aluminum and MacBook Pro models. Now you can get an affordable MacBook screen replacement regardless of where you are in Sydney. Our experienced technician can replace your MacBook screen glass onsite on the spot in 15-20 mins anywhere in Sydney. Alternatively you can also bring your MacBook to our Hurstville workshop and have the glass screen replaced on the spot in less than 20 mins. Macbook has a LED laptop screen as well as a front protective glass screen that protects the interior screen from being damaged or marked. If you happen to break the screen our experienced technician can replace the glass screen with a brand new Genuine Apple glass in less then 20 mins. But before we do anything, we need to find out which screen needs replacing. Is it just the front protective glass is broken? That means you can still see the internal display. even with the outer glass is broken or shattered. We offer the fastest service and most competitive price in Sydney and Australia wide. Get a free quote or contact Macbook expert and ask us if you have any questions.